If you use the software, please consider citing astroML. 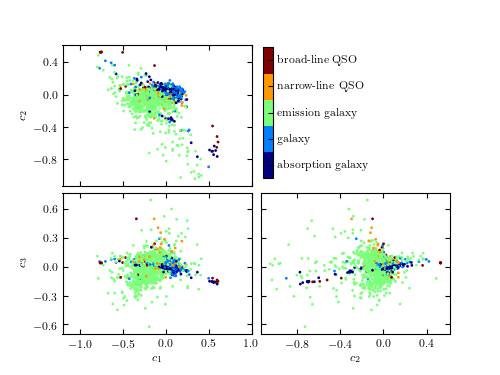 A comparison of the classification of quiescent galaxies and sources with strong line emission using LLE and PCA. 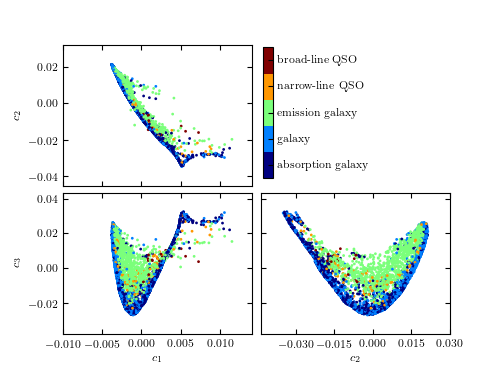 The top panel shows the segregation of galaxy types as a function of the first three PCA components. The lower panel shows the segregation using the first three LLE dimensions. The preservation of locality in LLE enables nonlinear features within a spectrum (e.g., variation in the width of an emission line) to be captured with fewer components. This results in better segregation of spectral types with fewer dimensions. # This function adjusts matplotlib settings for a uniform feel in the textbook. # you can set usetex to False. print " - finished LLE projection"